To qualify for hospital transport, you must live at least three miles from the hospital and have no other means of getting to your appointment, i.e. own vehicle, family, friend, public or voluntary transport. If you suffer severe physical or mental problems, or are attending for treatment which has physical side effects, you may qualify for transport. 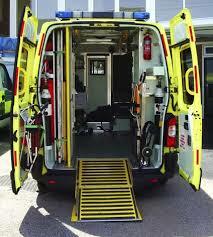 If you think you qualify for transport, please contact the patient and carer line on 0345 603 8117. Lines are open 8am - 6.30pm, seven days a week. As much advanced notice as possible is needed but bookings must be made at least 48 hours before your appointment. Patients are asked to be ready to travel TWO HOURS prior to their appointment time. If your hospital appointment is cancelled for any reason, please call the above number as soon as possible in order for the service to use their vehicles and staff in the best way possible. If you do not qualify for hospital transport it is possible you may be able to access one of the local Community Car Schemes - details below. You will normally be charged a nominal sum per mile to cover fuel costs etc. This scheme offers travel to a GP surgery or other medical appointments. For those who are unable to make essential journeys by other means. FACT operates a transport scheme for March, Whittlesey, Wisbech and the surrounding area for social and medical purposes.